The Puppy Angel No. 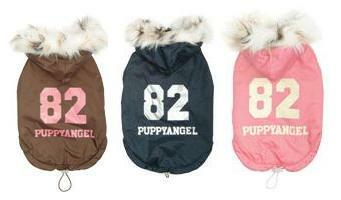 82 Padded Vest is perfect for protecting your pup from cold, rain and wind. Afterall, you have a thick padded coat - your dog must have one too because your pup still needs to take that walk! Featuring a waterproof outer shell with a fleecey lining, each coat has the numbers 82 on the back in sparkling print. There is also a drawstring toggle at the bottom to aid fit.